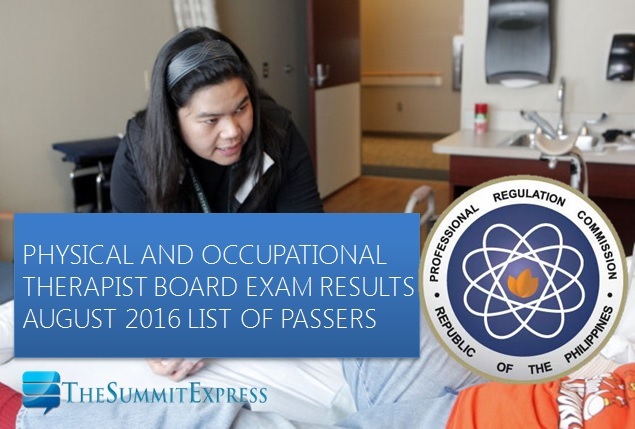 Those awaiting results of August 2016 Physical Therapist (PT) and Occupational Therapist (OT) board exam can find here the full list of passers, top 10 (topnotchers), top performing schools and performance of schools as the Professional Regulation Commission (PRC) officially released results in 3 working days after the exam. PRC on Wednesday, August 10, announced that 846 out of 1,243 passed the Physical Therapist Licensure Examination and 114 out of 229 passed the Occupational Therapist Licensure Examination. The second Physical and Occupational Therapists (PT-OT) board exam this year was administered on August 6 and 7 in the cities of Manila, Baguio and Cebu. According to PRC, the target date of release of Physical and Occupational therapist board exam results is on Wednesday, August 10, 2016 or in 3 working days after the exam. In February 2016 exams, results were announced online in just 2 working days from the last day of examinations. A total of 521 out of 912 passed the Physical Therapist Licensure Examination and 55 out of 102 passed the Occupational Therapist Licensure Examination. Licensure Examination and 107 out of 170 passed the Occupational Therapist Licensure Examination. With this, we advise examinees to monitor announcement of results starting Tuesday, August 9 or in 2 working days after the exam.